Today at Red Hat Summit 2018 in San Francisco, Microsoft and Red Hat will jointly demonstrate our OpenShift on Azure offering, the first fully managed and easiest to use version of OpenShift in the cloud. Since last year’s announcement about OpenShift Dedicated on Azure, based on customer feedback, Microsoft and Red Hat have created an offering that provides much more to customers than the original concept. It will be both fully managed and engineered to make it easier and quicker to use on Azure. What do we mean by fully managed? OpenShift on Azure will be jointly engineered, operated, and supported by both Red Hat and Microsoft. As a fully managed service, it will be kept up-to-date, with a single unified bill, integrated support experience, and in all respects a native Azure service. Our customers told us that this “one throat to choke” was incredibly important and missing from other cloud-based OpenShift offerings, so we’re happy to be able to meet that need. While customers can use OpenShift in many cloud environments today, the newly announced OpenShift on Azure makes it easier to set up and use with native Azure integration and leveraging the same Kubernetes technology that powers Azure Kubernetes Service. Within a few minutes you’ll have a new cluster, more quickly and easily than you’ll get with other public cloud offerings available right now. Open Service Broker for Azure (OSBA) also works with OpenShift for Azure (as well as Azure Stack), which automatically discovers and enumerates Azure services you can use, such as Cosmos DB, Azure KeyVault, and more. OSBA adds value to your OpenShift on Azure deployments by allowing you to easily integrate your other Azure investments. 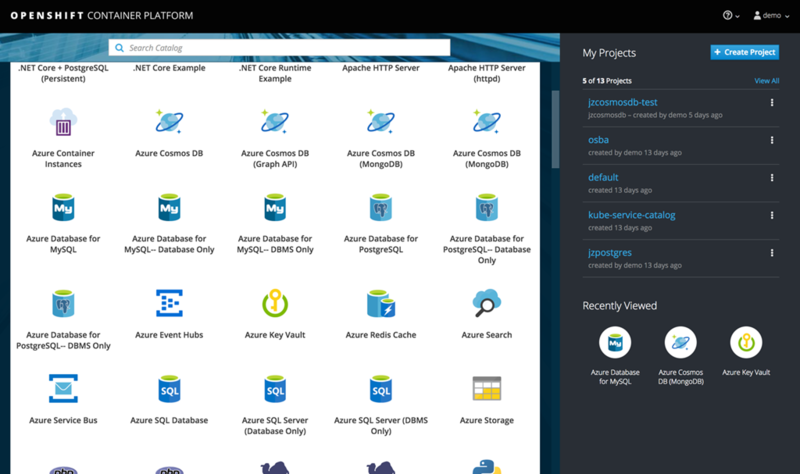 It’s another great ease of use feature to get you up and running quickly, as well connect to other projects you may already have or plan to build on Azure. To add even more goodness, when you combine all of this with the newly-announced Azure Stack and Windows Container support for on-premises OpenShift Container Platform, it’s a great fit for enterprise customers looking for a hybrid cloud container platform designed for both RHEL and Windows. Learn how to deploy OpenShift Container Platform on Azure Stack today. If you’re interested in trying out the new fully-managed OpenShift on Azure, please submit your contact details and we’ll reach out to you as soon as we announce the public preview.